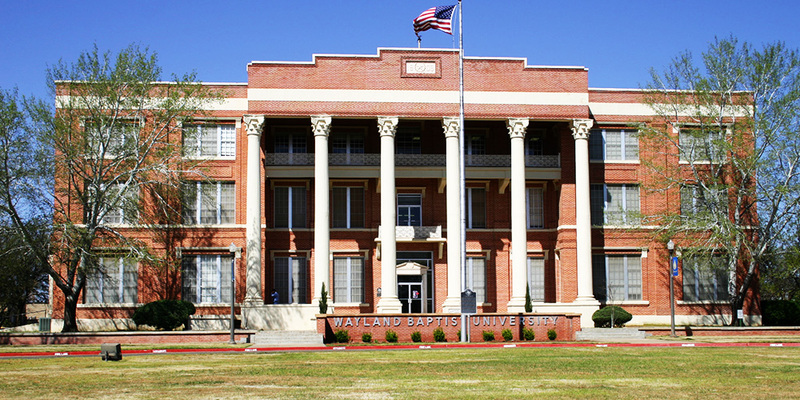 Wayland Baptist University is a private college that has its flagship campus in Plainview, Texas. Founded in 1908, the college took its name from James Henry Wayland and his wife after the couple donated a large plot of land and a large sum of money to the school. While still building its campus, the college opened its doors and offered courses in smaller buildings around town. In the 1950s, it became one of the first southern colleges to admit African American students. Though most students attend the Plainview campus, WBU also operates 13 other campuses in cities across the state and in some neighboring states. WBU also has its own campus in Kenya that is open to all students. As a Baptist university, WBU is unique because it puts a strong emphasis on faith and spiritual learning. All undergrads must agree to take religious studies courses as part of their education. The graduate programs that the university offers also have some religious and spiritual aspects. Students who enter one of the education programs will generally take courses that show them how to use their faith when teaching others. Graduates of these programs work in both private and public schools in Texas and in schools all across the country. Regional accreditation is mandatory for students who take undergraduate classes and want to attend graduate schools. Graduate schools will always ensure that the students took courses and earned their degrees from accredited schools. Wayland Baptist University has its regional accreditation from the Southern Association of Colleges and Schools. SACS accreditation also gives students the right to submit the FAFSA as part of the process of applying for financial aid. Many of the credits they earn through WBU are credits that they can transfer to other schools as well. In addition to its regional accreditation, Wayland Baptist University also has specialized accreditation for both its music and nursing degree programs. Its nursing program, which better prepares students for taking the national licensing examination and working with patients, has accreditation from the Accreditation Commission for Education in Nursing, Inc. (ACEN). Its music degree programs have accreditation from the National Association of Schools of Music. WBU has two separate applications for students applying to its undergraduate or graduate programs. Undergrads must complete the online application and pay a $35 application fee. They will also need to submit official scores from the ACT or SAT, but the university does not require that students complete the writing portion of those tests. The university also requires an official high school transcript. This transcript should show the student’s ranking within his or her class, the student’s cumulative grade point average and all the classes the student took prior to applying. Graduate students must complete a similar online application. In addition to asking for a current address, the application asks for other background information, including any internships the student did, the student’s interests and any future career goals. Whether a student needs to take the GRE or a similar examination depends on each individual program. Most programs will ask for an official college transcript that shows the student received or will receive a degree from an accredited university and lists his or her GPA. Graduate students will also pay a small $35 application fee. Those transferring credits from another college into one of its grad school programs must submit a transcript from the school where the student earned those credits. Wayland Baptist University uses a fixed tuition program that freezes the tuition rates charged at the beginning of each year. This lets students know that their rates will not increase as long as they remain enrolled in one of the programs available. Tuition for grad students starts at $540 per credit hour, which brings the total for full time students up to around $4,500 a semester. Full time students must take a minimum of nine credit hours of courses every semester. WBU offers several residence halls and apartment communities for grad students. Those who decide to live on its Plainview campus pay close to $3,000 a semester for a room and meal plan. All students must fill out the FAFSA and complete the institutional application available on the university’s financial aid website. The institutional application determines if students qualify for any scholarships or alternative funding programs, including programs on campus that let students work as reaching or research assistants. WBU will mail letters to students that show them how much money they will get each year. Those who decide to attend the university must log onto the financial aid website and accept that package. Scholarships and funding programs may have additional requirements. Wayland Baptist University offers a Master of Education program that has several concentrations available. Those who want to work with students who have learning disabilities and handicaps will want to enroll in the Master of Education in Special Education program. All graduate education students will take core professional studies courses like learning to lead and multicultural education. They must also take a capstone course that allows them to show some of the experience they gained while working with students. The university designed this program for both students who enroll immediately after finishing a bachelor’s degree and those who already have a teaching license and work in a school system. The capstone class that special education students take involves some research. Students typically pick a topic within special needs education and write a research paper or do an independent study project. After presenting the paper or project, the student will need to defend his or her opinions in front of a panel of professors working for the university. The program also requires that students take six courses outside of the professional core of classes. Special education courses include special education law, teaching students with specific disorders, appraising students with disabilities and a course on behavior management techniques. An optional course on education research is also offered. Wayland Baptist University gives graduate education students the chance to earn a Master of Education with a concentration in a specific field of study like special education or with a certificate in a topic like science education or instructional leadership.